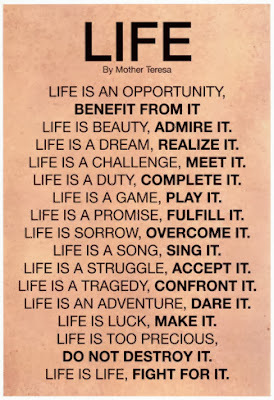 I so admire Mother Theresa because she found her life purpose and lived it until she died. Her life philosophy is a great one to live by. The next time you're feeling that life is unfair or others have disappointed you, think about Mother Theresa's simple words of wisdom. You may be surprised at the difference it can make in an otherwise terrible day.